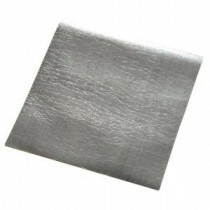 Buy online Silver Silent Guard 2/25 in. Thick 32.4 lb. Density Underlayment 150582520-60 and leave review or share with Your friends. The Silver Silent Guard is a scientifically designed underlayment for laminate, engineered wood, and floating hardwood flooring applications. Made with a unique rubber blend to absorb sound and topped with an attached moisture barrier, this product is engineered to create a quieter floor and repel spills. The Silver Silent Guard is an excellent choice for use over radiant heat floors.